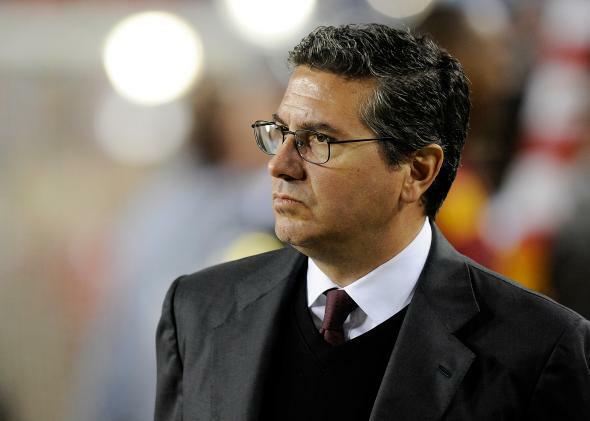 Daniel Snyder: How the NFL can negotiate with the Washington owner to change his team’s offensive nickname. The Washington owner said he’d never change his team’s nickname. How can the NFL get him to do it anyway? Washington NFL team owner Daniel Snyder has previously declared himself completely unwilling to compromise on the team’s name. In the wake of Wednesday’s finding by the U.S. Patent and Trademark Office that the Washington NFL team’s trademarks are “disparaging to Native Americans,” it seems like we may be drawing closer to a showdown between team owner Daniel Snyder and the NFL commissioner’s office. What would that showdown look like? As the co-host of Slate’s Negotiation Academy podcast, I’m intrigued by the dynamics involved. For the sake of this exercise, let’s assume that NFL Commissioner Roger Goodell and the 31 other NFL owners all privately wish that Snyder would make this issue go away by changing the team’s name. How might they negotiate with Snyder? Herein lies one of Snyder’s big problems. To change the team name now, after his bold pronouncements, would mean a serious loss of face. Negotiation theory suggests you’re better off thinking about your underlying interests rather than boldly stating your surface positions. Presumably, Snyder’s primary interest is to run a profitable and winning football team, the ownership of which brings him rewards both financial and emotional. I find it very hard to believe that this interest is in fact secondary to Snyder’s stated interest in maintaining the current team name—even if Snyder thinks that keeping the name will buoy his profits (by selling more merchandise and tickets than he would with a new name and logo) or his emotions (due to his longtime love of the name, the logo, and the team’s traditions, which he is reluctant to relinquish). If Snyder and the NFL did sit down to hash this out, the first big factor to consider would be Snyder’s BATNA. This is negotiation lingo for “best alternative to a negotiated agreement.” If Snyder walked away from the table without making any deal, where would he stand? There are other stakeholders here, too. If public pressure mounts, I expect Commissioner Goodell and his fellow owners to quietly speak with Snyder and—per the advice in Getting to Yes—help him clarify his underlying interests instead of staking out a fierce position against him. Snyder’s co-owners, and their families, will not want the stain of racism attached to them. Nor will the league be willing to let this tarnish its image. And the longer Snyder waits to act, the worse he and all these stakeholders will look in the end. What counsel could Snyder’s negotiation opponents give him? How could they allow him to save face while also serving the interests of both sides? For one, they might suggest that the trademark ruling is in fact a gift to Snyder—a means of sidestepping an increasingly deep and muddy quagmire. If Snyder chose to, he could use the ruling as a pivot point, acknowledging that, though he does not personally feel the team’s name is offensive, the ruling suggests that objective arbiters do, and so upon careful reconsideration he’s decided to make a change. But judging by the team’s defiant response to the trademark ruling, that’s not going to happen. If carrots become necessary, it might be reasonable for the NFL to declare that, in the interest of easing the path to a name change, Snyder will be given either a lump sum from the league’s coffers or receive a bigger cut of the shared revenue pie for a designated time period. This donation to the Washington football team could be tagged as recompense for the expense of rebranding the team, generating a new name and new logos, filing for new trademarks, and all the other associated costs involved. Paying an owner out of the league pot is not unprecedented: Baltimore Orioles owner Peter Angelos received money from Major League Baseball in return for letting the Montreal Expos become the Washington Nationals, thereby cutting deeply into the Orioles’ regional market share. If it comes to sticks, sponsors could pull their backing, as happened with the Clippers. FedEx might cite some sort of morality clause in its stadium naming rights contract and take away its support. And, of course, the NFL has the ultimate weapon: As recently demonstrated by Adam Silver and the NBA, if a major sports league wants you out it can generally find a way. If Snyder were wise, he would eschew positional bargaining and find a way to preserve his real interests. But nothing suggests that Snyder is wise. I expect him to negotiate the same way he runs his horribly monikered team: capriciously and, yes, disastrously.